The second mode of pressurization control is the constant differential mode, which controls cabin pressure to maintain a constant pressure difference between the air pressure inside the cabin and the ambient air pressure, regardless of aircraft altitude changes. The constant differential mode pressure differential is lower than the maximum differential pressure for which the airframe is designed, keeping the integrity of the pressure vessel intact. When in isobaric mode, the pressurization system maintains the cabin altitude selected by the crew. This is the condition for normal operations. But when the aircraft climbs beyond a certain altitude, maintaining the selected cabin altitude may result in a differential pressure above that for which the airframe was designed. In this case, the mode of pressurization automatically switches from isobaric to constant differential mode. This occurs before the cabin’s max differential pressure limit is reached. A constant differential pressure is then maintained, regardless of the selected cabin altitude. In addition to the modes of operation described above, the rate of change of the cabin pressure, also known as the cabin rate of climb or descent, is also controlled. This can be done automatically or manually by the flight crew. Typical rates of change for cabin pressure are 300 to 500 fpm. Also, note that modes of pressurization may also refer to automatic versus standby versus manual operation of the pressurization system. 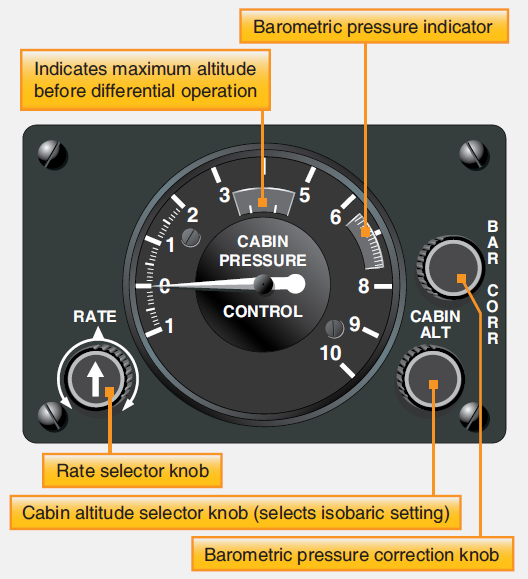 Adjustments and settings on the pressure controller are the control input parameters for the cabin pressure regulator. The regulator controls the position of the outflow valve(s) normally located at the rear of the aircraft pressure vessel. Valve position determines the pressure level in the cabin. Modern aircraft often combine pneumatic, electric, and electronic control of pressurization. Cabin altitude, cabin rate of change, and barometric setting are made on the cabin pressure selector of the pressurization panel in the cockpit. Electric signals are sent from the selector to the cabin pressure controller, which functions as the pressure regulator. It is remotely located out of sight near the cockpit but inside the pressurized portion of the aircraft. The signals are converted from electric to digital and are used by the controller. Cabin pressure and ambient pressure are also input to the controller, as well as other inputs. [Figure 2] Using this information, the controller, which is essentially a computer, supplies pressurization logic for various stages of a flight. On many small transport and business jets, the controller’s electric output signal drives a torque motor in the primary outflow valve. This modulates pneumatic airflow through the valve, which positions the valve to maintain the pressurization schedule. Modern pressurization control is fully automatic once variable selections are made on the pressurization control panel if, in fact, there are any to be made. Entering or selecting a flight plan into the FMS of some aircraft automatically supplies the pressurization controller with the parameters needed to establish the pressurization schedule for the entire flight. No other input is needed from the crew. All pressurization systems contain a manual mode that can override automatic control. This can be used in flight or on the ground during maintenance. The operator selects the manual mode on the pressurization control panel. A separate switch is used to position the outflow valve open or closed to control cabin pressure. The switch is visible in Figure 3, as well as a small gauge that indicates the position of the valve. Pneumatic operation of outflow valves is common. It is simple, reliable, and eliminates the need to convert air pressure operating variables into some other form. Diaphragms, springs, metered orifices, jet pumps, bellows, and poppet valves are used to sense and manipulate cabin and ambient air pressures to correctly position the outflow valve without the use of electricity. Outflow valves that combine the use of electricity with pneumatic operation have all-pneumatic standby and manual modes, as shown in Figure 2. 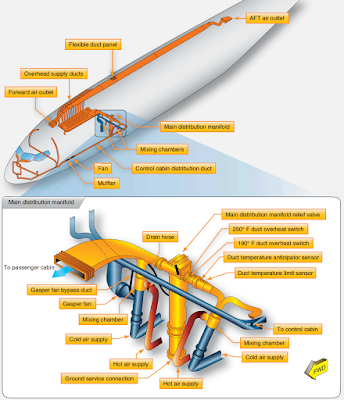 Aircraft pressurization systems incorporate various features to limit human and structural damage should the system malfunction or become inoperative. A means for preventing overpressurization is incorporated to ensure the structural integrity of the aircraft if control of the pressurization system is lost. A cabin air safety valve is a pressure relief valve set to open at a predetermined pressure differential. It allows air to flow from the cabin to prevent internal pressure from exceeding design limitations. Figure 6 shows cabin air pressure safety valves on a large transport category aircraft. On most aircraft, safety valves are set to open between 8 and 10 psid. Pressurization safety valves are used to prevent the over pressurization of the aircraft cabin. 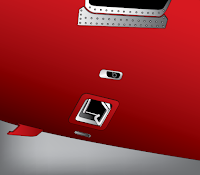 They open at a preset differential pressure and allow air to flow out of the cabin. Wide-body transport category aircraft cabins may have more than one cabin pressurization safety valve. Some outflow valves incorporate the safety valve function into their design. This is common on some corporate jets when two outflow valves are used. One outflow valve operates as the primary and the other as a secondary. Both contain a pilot valve that opens when the pressure differential increases to a preset value. This, in turn, opens the outflow valve(s) to prevent further pressurization. The outflow valves shown in Figure 2 operate in this manner. 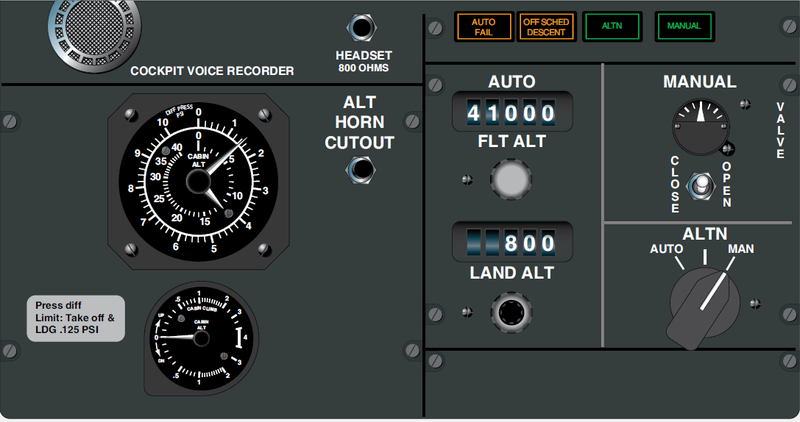 Cabin altitude limiters are also used. These close the outflow valves when the pressure in the cabin drops well below the normal cabin altitude range, preventing a further increase in cabin altitude. Some limiter functions are built into the outflow valve(s). An example of this can be seen in Figure 2. Other limiters are independent bellows units that send input to the outflow valve or are part of the cabin pressurization controller logic. A negative pressure relief valve is included on pressurized aircraft to ensure that air pressure outside the aircraft does not exceed cabin air pressure. 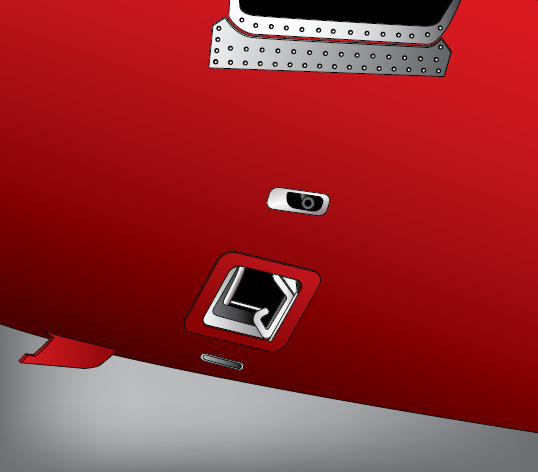 The spring-loaded relief valve opens inward to allow ambient air to enter the cabin when this situation arises. Too much negative pressure can cause difficulty when opening the cabin door. If high enough, it could cause structural damage since the pressure vessel is designed for cabin pressure to be greater than ambient. 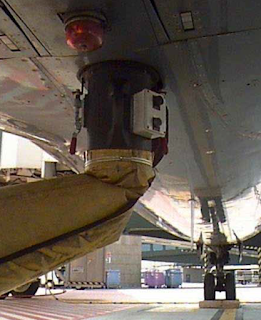 Some aircraft are equipped with pressurization dump valves. These essentially are safety valves that are operated automatically or manually by a switch in the cockpit. They are used to quickly remove air and air pressure from the cabin, usually in an abnormal, maintenance, or emergency situation. Incorporation of an emergency pressurization mode is found on some aircraft. 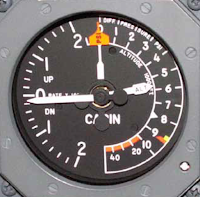 A valve opens when the air conditioning packs fail or emergency pressurization is selected from the cockpit. It directs a mixture of bleed air and ram air into the cabin. This combines with fully closed outflow valves to preserve some pressurization in the aircraft. 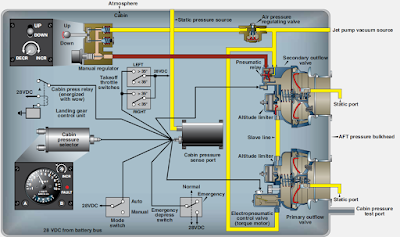 The normal mode of operation for most pressurization control systems is the automatic mode. A standby mode can also be selected. This also provides automatic control of pressurization, usually with different inputs, a standby controller, or standby outflow valve operation. A manual mode is available should the automatic and standby modes fail. This allows the crew to directly position the outflow valve through pneumatic or electric control, depending on the system. 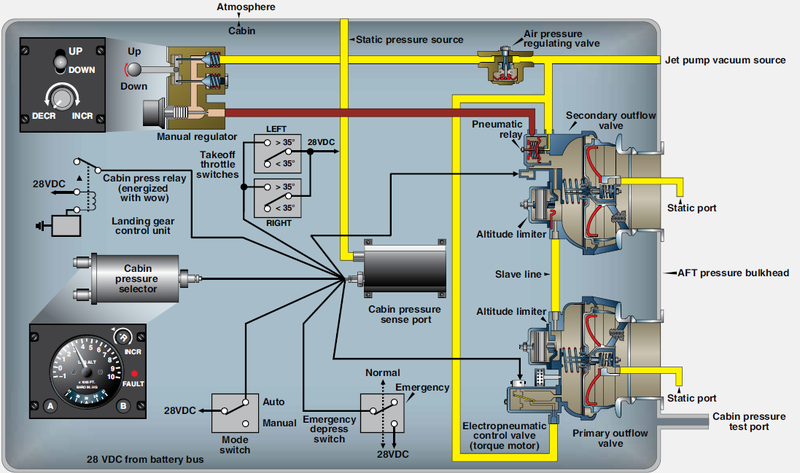 Coordination of all pressurization components during various flight segments is essential. A weight-on-wheels (WOW) switch attached to the landing gear and a throttle position switch are integral parts of many pressurization control systems. 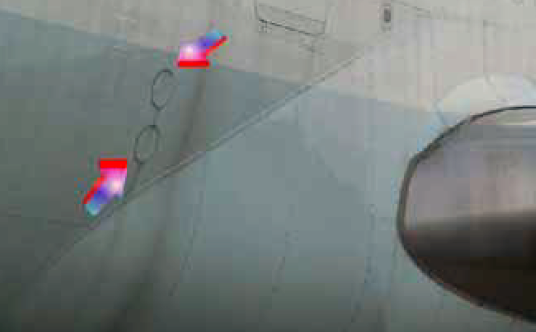 During ground operations and prior to takeoff, the WOW switch typically controls the position of the pressurization safety valve, which is held in the open position until the aircraft takes off. In an advanced system, the WOW switch may give input to the pressurization controller, which in turn controls the positions and operation of all pressurization components. In other systems, the WOW switch may directly control the safety valve or a pneumatic source valve that causes the safety valve to be held open until the source is cut at takeoff when the WOW switch opens. Throttle position switches can be used to cause a smooth transition from an unpressurized cabin to a pressurized cabin. 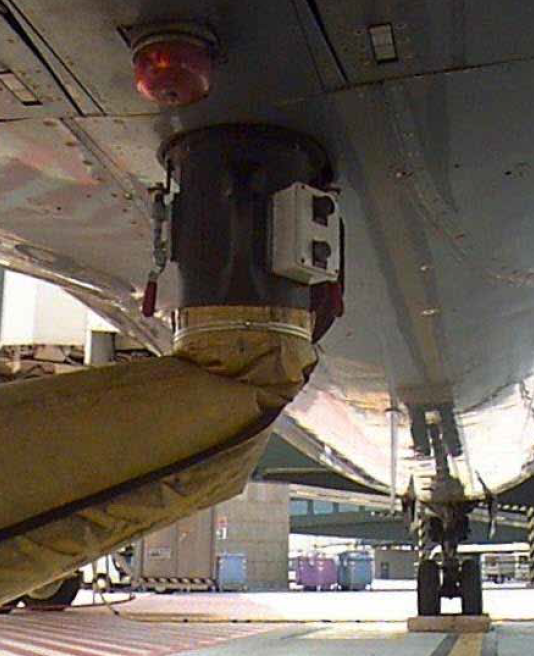 A partial closing of the outflow valve(s) when the WOW switch is closed (on the ground) and the throttles are advanced gradually initiates pressurization during rollout. At takeoff, the rate of climb and the pressurization schedule require the outflow valve(s) to fully close. Passengers do not experience a harsh sensation from the fully closed valves because the cabin has already begun to pressurize slightly. 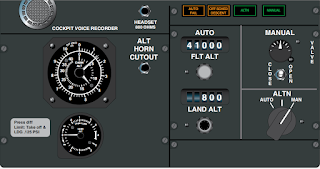 Once in flight, the pressurization controller automatically controls the sequence of operation of the pressurization components until the aircraft lands. When the WOW switch closes again at landing, it opens the safety valve(s) and, in some aircraft, the outflow valve(s) makes pressurizing impossible on the ground in the automatic pressurization mode. Maintenance testing of the system is done in manual mode. This allows the technician to control the position of all valves from the cockpit panel. 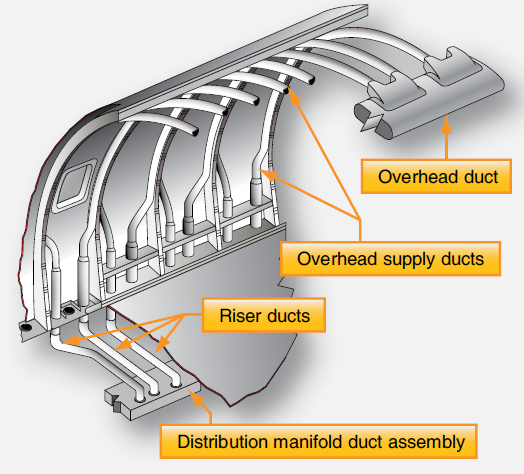 Distribution of cabin air on pressurized aircraft is managed with a system of air ducts leading from the pressurization source into and throughout the cabin. Typically, air is ducted to and released from ceiling vents, where it circulates and flows out floor-level vents. The air then flows aft through the baggage compartments and under the floor area. It exits the pressure vessel through the outflow valve(s) mounted low, on, or near the aft pressure bulkhead. The flow of air is nearly imperceptible. Ducting is hidden below the cabin floor and behind walls and ceiling panels depending on the aircraft and system design. Valves to select pressurization air source, ventilating air, temperature trim air, as well as in line fans and jet pumps to increase flow in certain areas of the cabin, are all components of the air distribution system. Temperature sensors, overheat switches, and check valves are also common. 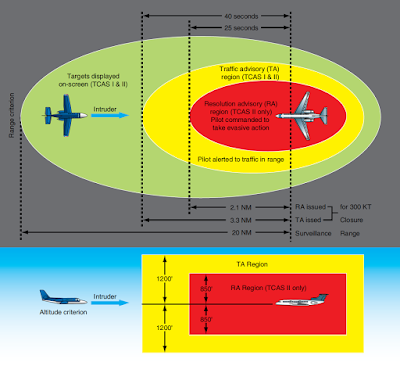 Large aircraft may be divided into zones for air distribution. Each zone has its own temperature selector and associated valve to mix conditioned and bleed air so that each zone can be maintain at a temperature independent of the others. While pressurization systems on different aircraft operate similarly with similar components, it cannot be assumed that they are the same. Even those systems constructed by a single manufacturer likely have differences when installed on different aircraft. It is important to check the aircraft manufacture’s service information when troubleshooting the pressurization system. A fault, such as failure to pressurize or failure to maintain pressurization, can have many different causes. Adherence to the steps in a manufacturer’s troubleshooting procedures is highly recommended to sequentially evaluate possible causes. Pressurization system test kits are available, or the aircraft can be pressurized by its normal sources during troubleshooting. A test flight may be required after maintenance.